In the Nightingale-IV, the Dayton RS180s 7" is replaced by HiVi's M8a. 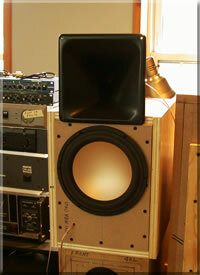 With a slightly larger woofer, I hope to get a better bass response. The horn section remains the same, a Pyle PH715 Asymmetric Horn coupled to a Selenium D220Ti 1" Compression Driver. Potential buyers should be aware that the mounting holes of the PH715 do not comform to standard 3" hole to hole spacing. New holes must be drilled to mount a "bolt-on" driver. When I measured the M8a, my Thiele & Small Parameters differed greatly from HiVi. After much thought, I eventually decided to load the M8a in a Closed Box of 20L. Though it may not go as low as a Bass Reflex, I have the comfort of knowing that the mid-bass will be preserved. Another aspect that was rather disconcerting is the cone breakup. A sharp peak just after 2,000Hz is visible in HiVi's Frequency Response (Fig 1). Obviously, this driver is meant to be used in a 3-way more than a 2-way. I would usually pick a frequency one octave, if possible, two octaves away to avoid that peak from intruding into the highs. Unfortunately, it would mean using a 2" compression driver which I want to avoid. The plots below (Fig 2) are the In-Room responses of the M8a, taken on-axis with the cone. The Black trace is the M8a without any crossover. The cone breakup is indeed recorded at just beyond 2,000Hz. The Red trace is with the Synergy crossover at 1,750Hz. I'm not too comfortable with this frequency because it doesn't seem to suppress the peak enough. The Blue trace is at 1,500Hz. Now, this looks much better. I can of course, use a notch filter but that would incur additional cost. If the offending peak can be suppressed by judicious selection of crossover corner frequency, so much the better. The Red trace below (Fig 3) is of the M8a crossed at 1,500Hz to the D220Ti/PH715. As with the Nightingale-III, an 8.2uF capacitor is in series with the D220Ti. No other passive components are used. The compression driver is connected in Reversed Phase. Measurements are taken with the microphone placed On-Axis with the PH715.